AMINTOHRU-M is a deodorizer and composting accelerator that is made from vegetable ingredients like soybeans fermented by probiotic strains. This product is composed of enzymes, minerals, amino acids, vitamins and probiotic strains. It inhibits the growth of miscellaneous germs and pathogenic bacteria. When it is applied to fresh manure or immature compost, it quickly rises the temperature of fermentation and facilitates the composing process. 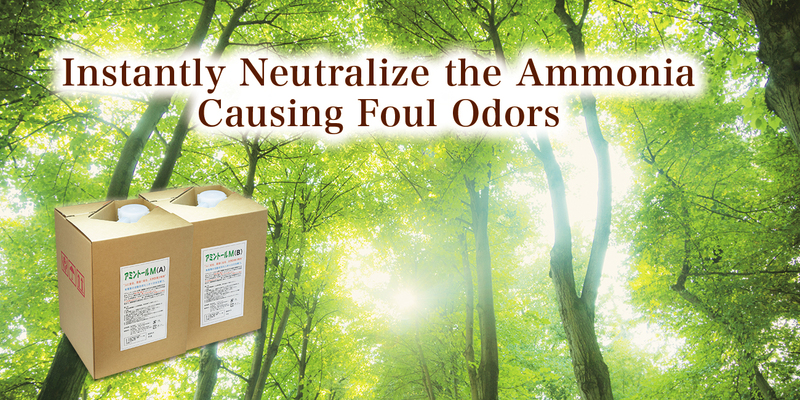 Furthermore, AMINTOHRU-M eliminates offensive odors by instantly neutralize the ammonia causing foul odors when spraying it in livestock barns or compost depots. 1. Instant odor elimination: Notice its effect immediately. As AMINTOHRU-M is an acidic liquid containing lactic acids, it neutralizes and instantly deodorizes alkaline odors such as ammonia and amine (acidic + alkaline = neutral). 2. A long-lasting odor elimination: Satisfactory results from continued use. 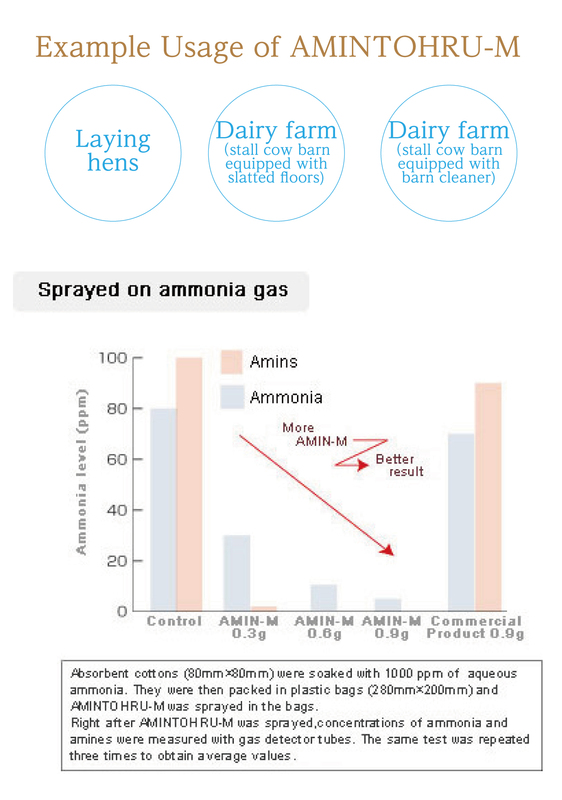 AMINTOHRU-M reduces the production of offensive odors by inhibiting the growth (metabolism) of bacteria that produce harmful substances. AMINTOHRU-M contains lactic acid bacteria that can grow in a high concentration of ammonia and these bacteria can break down substances causing offensive odors. 3. 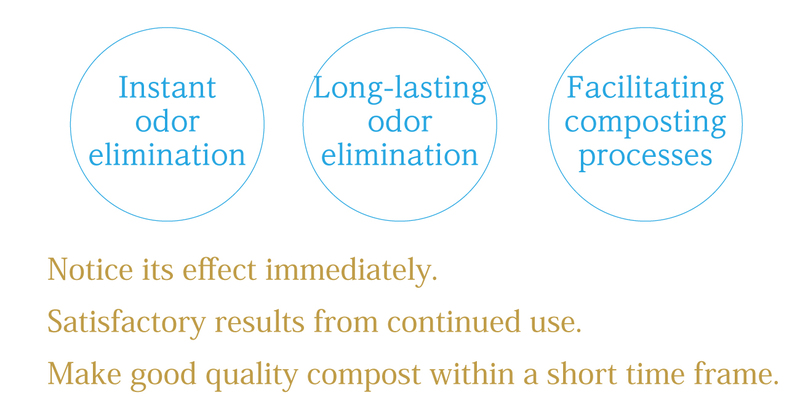 Facilitating composting processes: Make good quality compost within a short time frame. Microorganisms in feces and urine grow by absorbing and breaking down nutrients in organic matters found in them. However, depending on how the barnyard manure is treated, these microorganisms may not grow. These indigenous bacteria have to be active in order to utilize their ability to decompose organic matters. AMINTOHRU-M contains amino acids and vitamins that are necessary for the activation of the indigenous bacteria. Furthermore, lactic acids in AMINTOHRU-M are capable to decrease the pH level which in turn inhibits the growth of microorganisms causing putrefaction and facilitates the composing process.